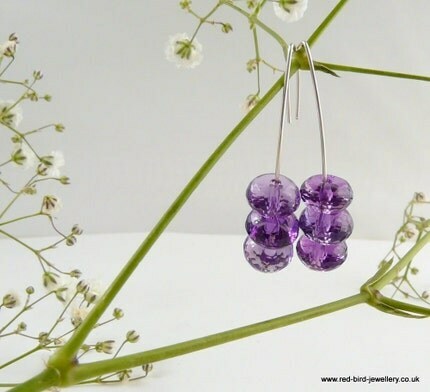 Kate and Oli: Focus On... Red Bird Jewellery And A Giveaway! Becky is the super sweet gal behind Red Bird Jewellery, an etsy shop I adore! She has an eye for color and form and I love her juxtaposition of aged brass and shiny gemstones. Becky fabulously offers free worldwide shipping all the time! What kind of mediums do you use and why? Until relatively recently I was a complete stumblecrafter - trying everything from sewing, to mosaics to upholstery, until I happened upon jewellery making, and got completely hooked! I now love working with fine and sterling silver, copper, brass and gemstones. What made you decide to sell on etsy? I will always make stuff, and there's only so much jewellery that one girl needs (or can accomodate in her house). So what I can't wear, or give as gifts, I sell on etsy to support my making habit. Etsy is just like a wonderland for me, I could spend days just looking at all the lovely stuff there. Where do you get your inspiration? I know it's a bit of a cliche, but I am a country girl, and get most of my inspiration from nature. I live in a little village at the foot of the North Downs, and was brought up (and still often visit) Derbyshire, so there's always some countryside nearby. I like simple clean designs, nothing too fussy. What is your favorite music to craft by? I've got VERY ecelctic tastes when it comes to music from Dolly Parton to The Smiths. But at the moment I'm reliving my indie kid youth, and listening to The Pixies and Throwing Muses - I'm also currently partial to a bit of Florence and the Machine. If I'm honest though, I do like to craft along to Radio 4 - I find it really soothing! When it's cold outside... I wrap up warm and get out there! Love cold crisp days, or wet days puddle-jumping with my kids, snowy days building snowmen. All the better to have a large hot chocolate when I get back inside. When I need a boost... I turn the music up very loud and sing along even louder. I wish I was/were... a clairvoyant so I could know what would happen and that it'd all end up fine. If I could give one gift to everyone I know, it would be... restful sleep - now I've had 2 kids I know understand how important it is. Rock n roll eh? If I could have coffee with anyone, it would be... Margaret Atwood - love her books and she sounds like a fascinating person. If you were an animal, what would you be? a Llama - no reason other than they're quite smiley and so am I. What's your favorite piece of your own? I like my flow collection - especially the Flow and Colour Necklace. What are your favorite blogs/websites right now? Craft Blog UK and UK Handmade. 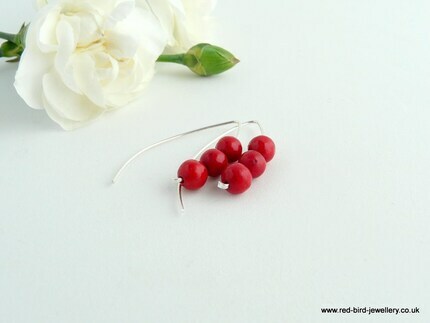 Becky has offered a fabulous pair of coral and sterling silver earrings to one lucky giveaway winner! Head over to Red Bird Jewellery and tell me your favorite item! - Become a Facebook fan of Red Bird Jewellery. - Follow the Red Bird Jewellery Blog. Fine print: Giveaway begins when it is posted and ends at 11:59pm pacific standard time May 11, 2010. A winner will be selected by a random number generator on the morning of May 12, 2010 and will be emailed promptly. Red Bird Jewellery will ship anywhere in the world! 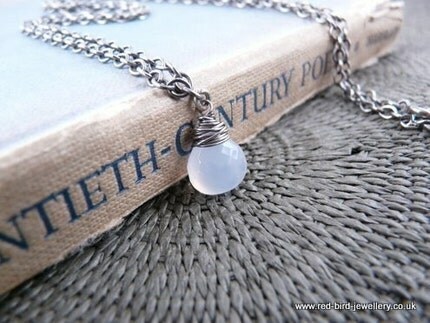 I love the Moonlight - Chalcedony wrap pendant and chain, so lovely. I'm following on google reader. I voted for Kate and Oli on the top 20 list, and found some great new bookmarks there too. Very nice jewelry. I like the Moonlight - Chalcedony wrap pendant and chain the most. It's very nice. From the shop, I love the Neon Apatite Chalcedony with hammered silver pendant and the little silver heart earrings! Also, I'm following the red bird jewelry blog. Love the Flow Necklace -- reminds me of a sine wave! Such a fun giveaway, thank you! I just love the La Scala Necklace! 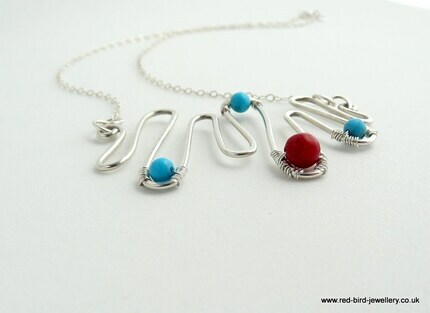 I follow the Red Bird Jewellry blog! I voted for Kate and Oli in the Top 20 Art and Craft blogs! my favorite is the Garnet Droplet Earrings! 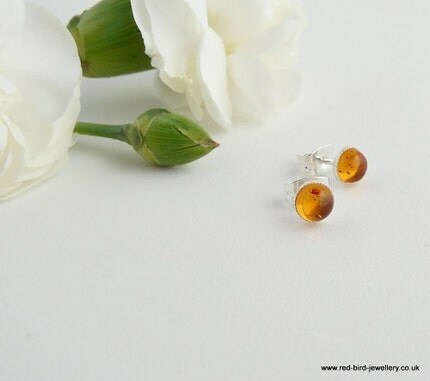 became a friend of red bird jewellery on facebook! Love the silver leaf pendant! Love the silver hoops with green onyx! I love the turquoise and coral silver pendant at her shop. She has beautiful pieces! Etsy is a wonderland for me too. I spend way too much time on there. I like the Bird On A Wire bracelet. I love the Silver flow pendant with turquoise. Loving the FLOW necklace! thanks for the opportunity! Entry 1 - I'm now following your blog. Good questions! wow, love the bird bracelet! great giveaway. I love the Big and beautiful bright red necklace. I am a FB fan of Kate and Oli. I like the Roma Earrings. Signed up for the Kate and Oli mailing list. I voted (14%, 61 votes). I am a Red Bird fb fan and have fanned Kate and Oli and voted. 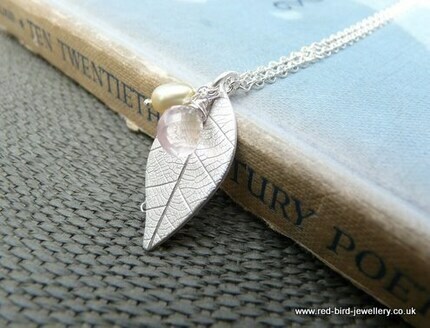 I adore the "Spring silver leaf pendant with pearl and rose quartz"! 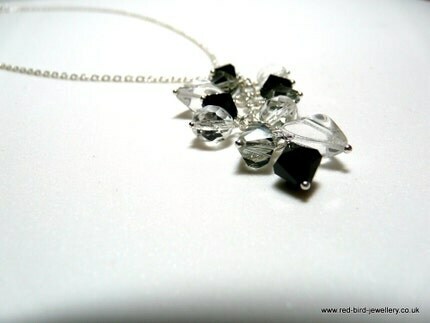 I became a Facebook fan of Red Bird Jewellery! I follow the Red Bird Jewellery Blog. I am a Facebook fan of Kate and Oli. I voted for Kate and Oli in Adelle's Top 20 Art and Craft Blogs! I have two favorite items: the Moonlight - Chalcedony wrap pendant and chain and the Silver flow pendant with turquoise! I am a FB fan of Kate and Oli (Stase L.) stasew at hotmail dot com. Spring Promise Necklace. Thank you. I love the Turquoise and hammered silver pendant. very beautiful. I'm an email subscriber. Thank you. Love the "Bird on a Wire Brass and Jasper Necklace"...BEAUTIFUL, and beautiful giveaway! I'm now following Red bird blog! I love the Roma Earrings!! Hmm I love so many of the earrings and necklaces ...but my favorite is probably this leaf necklace! It looks so sleek and elegant! 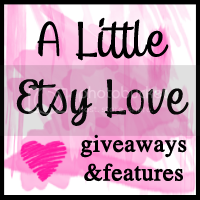 I voted for your blog in Adelle's Top 20 art and craft blogs! My favorite are actually the coral and sterling silver earrings but I also love the silver hoops with black agate earrings. I am a Facebook fan of Red Bird Jewellery. My favorite item is the Sleeping Satelite Necklace. Facebook fan of Red Bird Jewelry (amymace). Following Red Bird Jewelry Blog via Google Friend Connect. Facebook fan of Kate and Oli (amymace). I am a follower and I love the Fine silver leaf earings. Bird on a Wire Brass and Jasper Necklace. love how it's so big and chunky and bold! Christina - xristya@rock.com - I love the Silver Flow Earrings With Turquoise - very imaginative! Coral and sterling silver necklace. 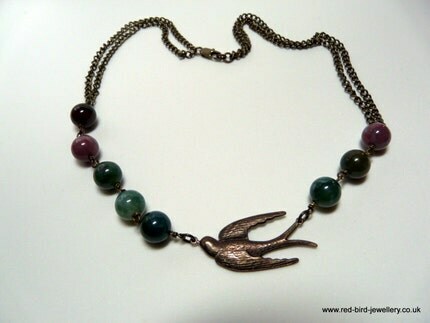 My favourite piece is the Bird on a Wire Brass and Jasper Necklace, just beautiful! 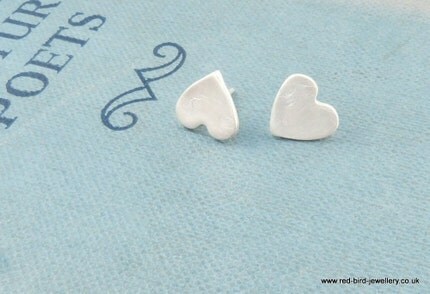 I adore the tiny silver hearts earrings! 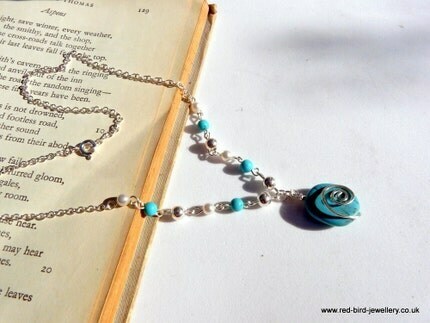 ...and I am following Red Bird Jewellery's blog too. 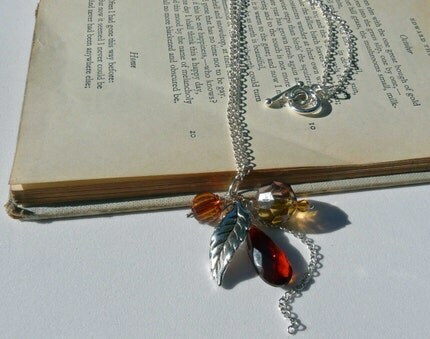 Autumn days necklace is lovely! Thanks for letting me see such marvelous craftsmanship! LOVE LOVE LOVE the Amethyst Stack earrings! I am their FB fan, Tofu Fairy. I follow their blog via GFC. Silver flow earings with turquoise are so artistically done and so remind me of water...just awesome. PS I follow you w/google too! Mystic quartz wrap earrings are beautiful!! Love them! Sign up for the Kate and Oli mailing list. I'm following red bird's blog! 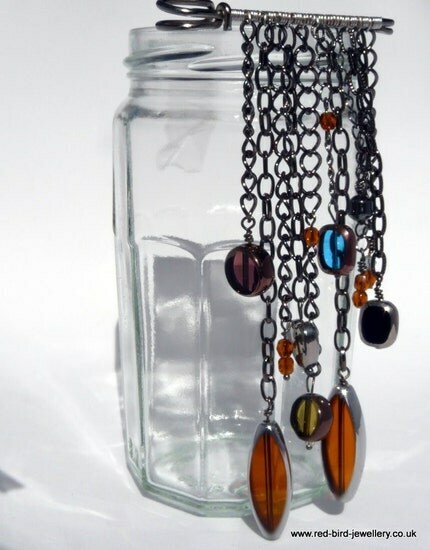 I love the Autumn Days Pendant Necklace! Christina - xristya@rock.com - My favorite is the La Scala Necklace, and I also love the bird jewelry because I've always loved birds! Nice article and great knowledge about Green Onyx. I love this story and enjoy with your words!